A crazed, probably terrified squirrel scaled the netting behind home plate at Citizens Bank Park Friday night during the Philadelphia Phillies' game against the St. Louis Cardinals. Then things got interesting. Things got nutty at Citizens Bank Park on Friday when a crazed squirrel scaled the netting behind home plate, flew through the air, and assaulted a member of the Philadelphia Phillies, sending all assembled into hysteria and members of the field-level press corps in search of higher ground. The squirrel made his or her entrance to the proceedings by walking directly onto the field in front of St. Louis Cardinals' third-baseman Matt Carpenter during his second-inning at-bat. Immediately reversing course, the squirrel, who appeared under the influence of advanced narcotics, fled the area. Two pitches later, as Phillies hurler Phillipe Aumont readied to throw to Carpenter, television cameras caught the rascally rodent summitting the park's protective netting. The footage then shows that it proceeded north-northeast along the first-base-line portion of the steel cable that holds the netting up, until it found itself roughly 25-feet above the home team's dugout, prompting a Phillies' broadcaster to gravely warn his television audience, "This might not end well." Aumont and Carpenter ceased the at-bat altogether when shrieks of terror signaled the squirrel's descent - through the air - onto the top of the Phillies dugout. 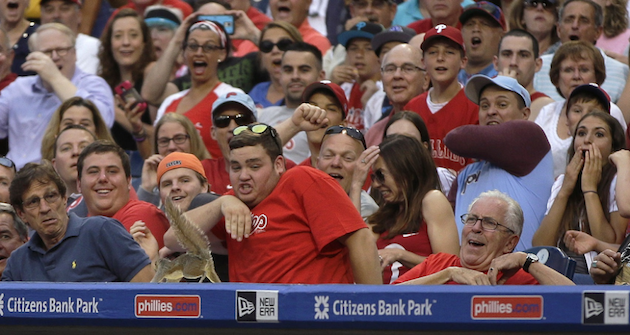 Several Phillies fans, the same lot known for once booing a man dressed as Santa Claus at a professional sporting event, unsurprisingly appeared repulsed and confounded by the squirrel's presence. 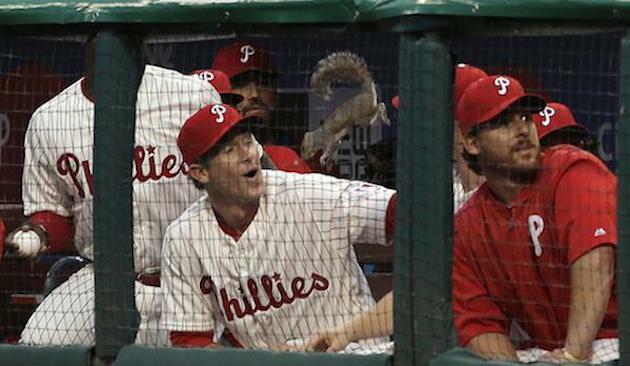 They were thoroughly unprepared when, dazed but still ambulatory, the animal flopped in a seething rage off of the dugout's roof and into the Phillies' crowded inner sanctum, coming snout-to-snout in mid-air with second baseman Chase Utley. At this point, the dugout cleared. The delicate Utley, who in his later years has become better known for his tendency to easily injure than his on-field performance, thankfully was unharmed beyond light bruising and an allergy to fur. The squirrel had last been traced to a crawl space down in the media camera well, according to the Comcast Sports Net Philadelphia broadcast, which will no doubt earn numerous awards for its coverage of the events preceding.